Here we have the conceptual design of the belt drive system that is integrated into the engine mount. We still need to complete this but these images give you a feel of how it's all going to work. 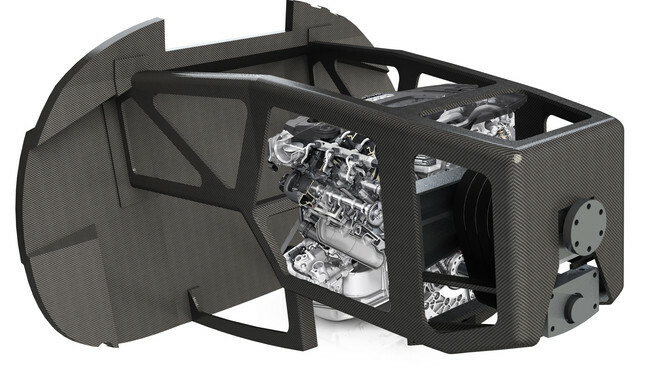 Basically we have a carbon fiber engine mount that has a left side and a right side (seam is not visible in this picture). They will be bolted around and to the engine and then the whole assembly will be hoisted into place and bolted to the firewall. This will create a rigid frame that will evenly transfer the weight of the engine and the thrust of the propeller to the rest of the airframe via the firewall and main wing spar. This configuration also makes maintenance easy as the whole assembly can quite readily be removed from the rest of the aircraft. Mid way up on the other side of the firewall is where the main wing spar is located thereby transferring those loads into the strongest part of the airframe. The propeller is bolted to the top belt drive pulley which has 4 bearings (2 front and 2 rear) that will take the load of the thrust produced by the 5 bladed propeller. The lower pulley connects directly to the engine crank shaft and is also supported by 2 bearings on the near side. In order to provide correct tensioning on the belts the engine mounts will be adjustable to lower the crank shaft if adjustment is required. It's difficult to see from this picture but the system has been designed so that the upper pulley can be lowered and both pulley front brackets removed in order to allow the belts to be replaced without having to remove the engine or any part of the engine mount. 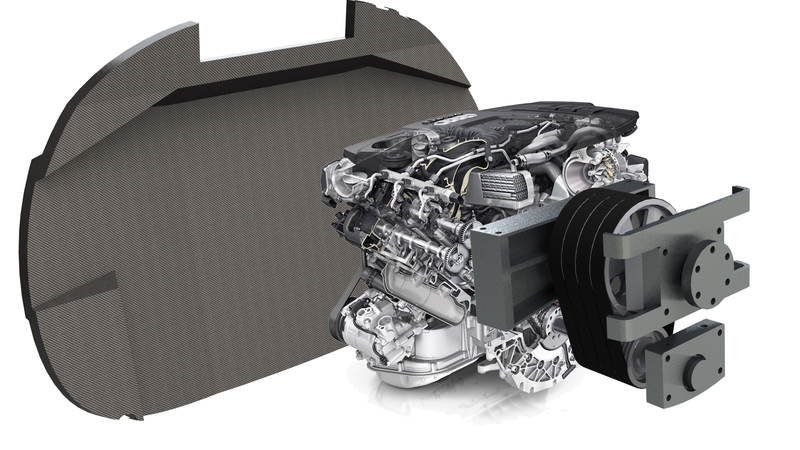 This integrated engine mount / belt drive design easily provides enough rigidity to handle the almost 500 ft lbs of torque that can be generated by the Audi TDI engine. With the engine mount removed you can more easily see the belt drive system. It's simple, light weight and cost effective. With 4 belts it has enough redundancy built in to provide peace of mind. We will also be incorporating a small camera with an integrated light that will be pointing at the belts. This way, from the cabin, you will be able to monitor the condition of the belts while enroute. We still have more work to do on this design but this is the basis of how we will convert the power of the Audi engine into thrust. The belt drive will provide close to a 2 to 1 ratio thereby setting up a cruise RPM of about 3200 for the engine with the prop turning at a leisurely 1700-1800 RPM. This will keep the noise signature very low. With the high torque of this engine coupled to a large 5 bladed prop departures and climb will be brisk.